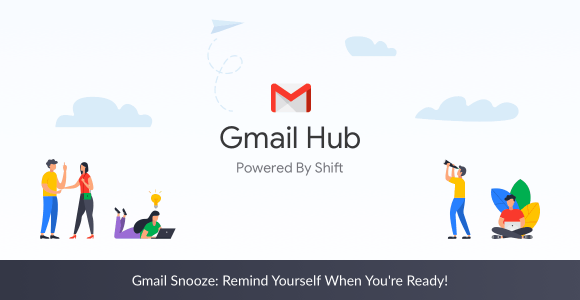 Gmail Snooze: Remind Yourself When You’re Ready! Ah, snooze. One of the most exciting words in the world when it comes to postponing your morning. But what is Gmail Snooze and how do you start using it? Gmail’s Inbox overhaul was initially met with a mixed reception. Despite a Shiftload of new features like Gmail delegation and confidential mode, some people just don’t like change. That said, months down the road and continued discoveries of all of the features it has later – it’s finally even won over its critics. So, what is the Gmail Snooze feature? As well as being a Godsend for those with far-too-busy inboxes, it also works as a reminder that sorting your mail into “read later” folders don’t. Gmail Snooze allows you to “snooze” an email, which goes without saying. What snooze in this instance means is that, by selecting snooze on an email, you can set a time and a date for the email to pop back up in your inbox. Jokes aside, Gmail Snooze is a crazily handy feature. It’s only a matter of time until other email services try to do the same. On the flip side, being able to snooze emails is such a good idea that it also might be used a little too much. Therefore, exercise caution on which emails you’re snoozing.  A survey you have until next week to fill in – go ahead!  A document you’re supposed to sign before the weekend? Ehh, maybe not. You know we are all about productivity at Shift. So if you are looking for ways to makes your Gmail management more productive, we urge you to try Gmail snooze function in Shift today!